Even a small fire can cause significant damage to a business, putting the lives of those who work there at risk. All non-domestic buildings should have a fire alarm fitted for safety purposes and to detect fire, and also for insurance purposes. Fire alarm systems operate in largely the same way; using detectors to sense heat or smoke, or a manual break unit. If the alarm is triggered, a warning sound will alert the building’s occupants, whilst some systems will also report the event to the emergency services. A number of commercial fire alarm systems are available which use combined sensors, designed to detect either smoke, heat or CO2, depending on the type of business and where the alarm is located. If you run a catering business, for example, there would be little point in installing smoke detectors as heat sensors would be a much better option. On the other hand office buildings, for example, are at greater risk of fire caused by combustible materials such as paper and soft furnishings, making smoke detectors the safest choice. 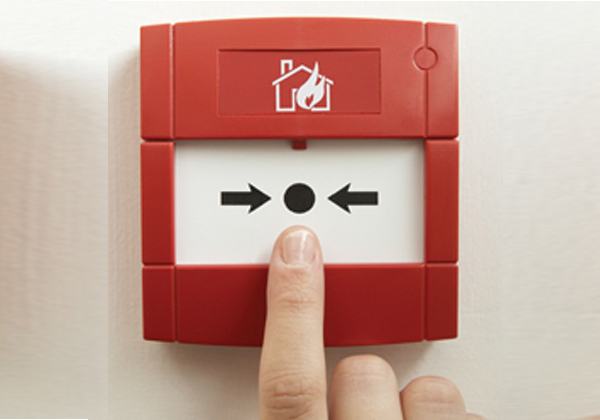 As fire alarm installation specialists in Leeds, we will install the most appropriate fire detection and alarm to suit the unique requirements of your business. Our alarm installations are in line with British Standards BS5839-1. Before carrying out an installation we will carry out a risk assessment to determine the type of building and how it used. A residential care home or student accommodation which have permanent residents would, for example, be assessed in a different way to an office building where people are only present during the day. We also take into account the ease of emergency evacuation which is particularly important in some environments such as care homes or schools. Every fire alarm we install comes with a commissioning certificate, installation certificate, fire alarm plan, user guide and weekly test log book. In addition, we also offer a range of servicing plans, designed to provide peace of mind and ensure that you meet legislation. To find out more about how we can help you protect your business premises, staff or residents from the risk of fire, please contact FirstEye to arrange your free risk assessment survey and quote.